On the night of July 5, 1964, one of the members of Roger Donlon's Special Forces Team at Nam Dong wrote his wife saying: "All hell is going to break loose here before the night is over." He was not alone in his premonition...most of the twelve men manning the small outpost just 24 kilometers from Laos in the Republic of Vietnam, had the same feeling. Earlier Captain Donlon had told his team sergeant, "Get everyone buttoned-up tight tonight, the VC are coming. I can feel it." But as the 30-year-old former West Point student made his 2 A.M. rounds of the small perimeter, all seemed quiet and he began to wonder if perhaps he was wrong. In previous days there had been indications that something was about to happen. Patrols outside the base camp had noticed increased activity, the villagers seemed nervous and scared, and the morning before one of his teams had returned from a 3-day patrol to report finding the corpses of two village chiefs who had been friendly to the Americans. It was 2:26 A.M. as Captain Donlon finished his rounds and stepped through the screen door of the mess hall to check the guard roster. The twelve members of Special Forces Team A-726 were ready, whatever the darkness of that early morning might hold. So too were the 311 South Vietnamese soldiers and 40 Nungs (ethnic Chinese who worked with Special Forces) that completed the contingent at what Army Chief of Staff General Harold K. Johnson described as "An outpost of Freedom." Suddenly the building erupted. The concussion of the exploding enemy mortar round threw Captain Donlon back out the door where he saw another round hit the command post and set it on fire. From the perimeter came the sounds of small arms and machine gun fire. Nam Dong was under attack. Heedless of the continuing barrage of incoming mortar rounds and the flash of tracers across the camp, Donlon and team sergeant "Pop" Alamo began battling the blazes that threatened the camp, salvaging whatever they could. That done, Captain Donlon raced for one of the mortar pits. Suddenly an enemy mortar exploded near his feet, tossing him into the air. Despite the concussive force that had literally blown off one of his boots and left him fighting dizziness, Donlon crawled into the mortar pit just in time to hear Sgt. John Houston call out, "They're over here! By the ammo bunker." As the fearless Captain left his shelter to assist Houston a third mortar round exploded near him. Donlon lost his other boot and all of his equipment except his AR-15 rifle and two magazines. Worse, shrapnel had seriously wounded him in his left arm and stomach. He managed to force his battered body to another mortar pit from which he could see enemy soldiers only 20 yards from the main gate. Sgt. Houston was dead, Donlon severely wounded, and the enemy seemed to keep on coming. For five hours Captain Donlon moved from position to position, dragging needed supplies and ammo to the defenders of Nam Dong, directing fire, and encouraging his men. Upon entering one of his teams own mortar pits and finding most of the men wounded, he directed their withdrawal to a position 30 meters away and provided cover fire for them. Then, while attempting to drag the severely wounded Pop Alamo from the same position, he was hit again by mortar fire that wounded him in the shoulder and killed his team sergeant. Struggling 30 yards further from the abandoned pit, he found four wounded Nungs lying beside a brick wall. He used a sock as a tourniquet for one, tore his shirt into bandages for the others, then stuffed a remaining scrap into the bleeding hole in his stomach. Before continuing on he propped them against the wall with weapons in their hands, encouraging them to continue the defense. As he moved from position to position, he was hit again…and again…and again. Shrapnel pierced his leg, his face, his entire body. But with determination, he battled the fatigue and wounds to continue to lead his men, tend their wounds, direct their fire, and personally defend his "Outpost of Freedom". When morning dawned, the five-hour battle had left 55 of the South Vietnamese and Nung defenders of Nam Dong dead, another 65 wounded. Pop Alamo and John Houston were also dead, never to witness the birth of children their pregnant wives were bearing at home. But the defenders at Nam Dong had held through the night, outnumbered at least 3 to 1 by a reinforced battalion of enemy soldiers. 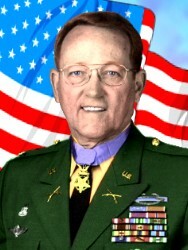 Donlon's team would become one of the most highly decorated units in Army history. 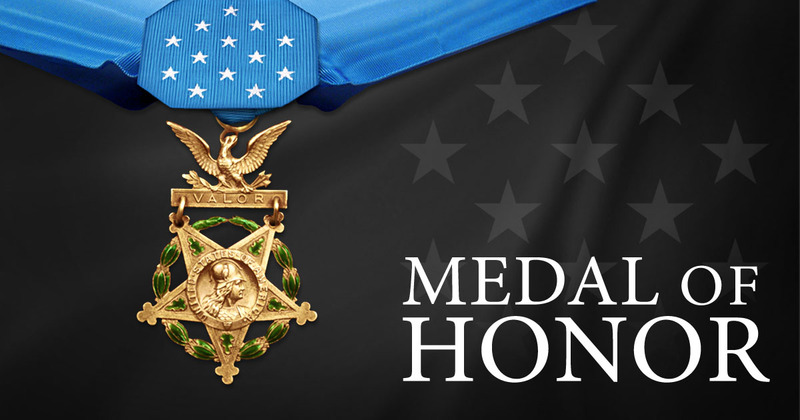 In addition to Donlon's award, our Nation's second highest medal for military valor The Distinguished Service Cross was presented posthumously to Alamo and Houston. Four team members were awarded the Silver Star, the other five team members each received the Bronze Star with "V" for valor. On December 5, 1964, all nine surviving members of Team A-726 joined Captain Donlon in the East Ballroom of the White House as President Lyndon Johnson hung the Medal of Honor around their team leader's neck. The humble hero introduced them all to the president and said, "The medal belongs to them, too." Later he would write of that night, "It was a team effort, and I was simply the designated leader." 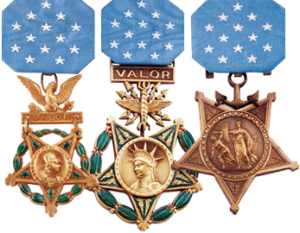 Captain Donlon's award was the first Medal of Honor awarded for action during the 14-year Vietnam War. 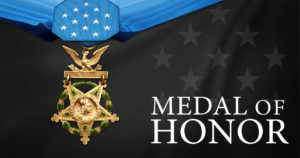 238 American soldiers would ultimately be awarded our Nation's highest honor in that war. One hundred fifty of them died in their moment of Valor.